Tonight's leftover level: 6 out of 10. Tonight's inspiration level: 3 out of 10. You'll never guess what I did with the leftover Caesar salad ingredients. Okay, give up? 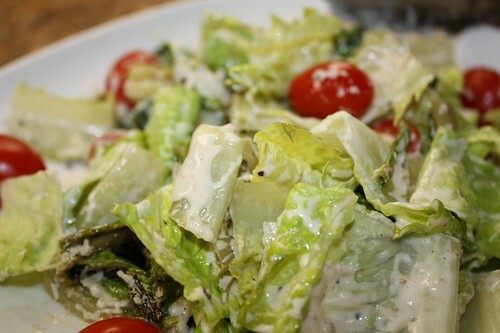 I chopped them up, tossed them with more Caesar dressing and made Caesar salad! I'm one of the last truly great culinary improvisers of our time. 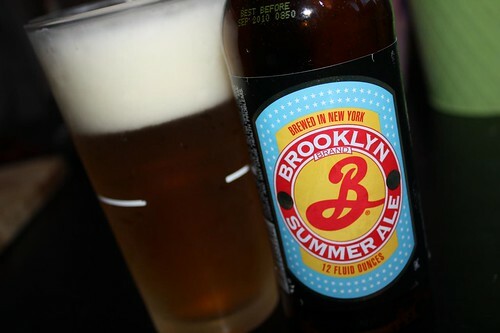 I recently picked up some of Brooklyn Summer Ale. I had a strange idea for it: I poured it into a frosted glass and drank it! But that was only part of my idea! 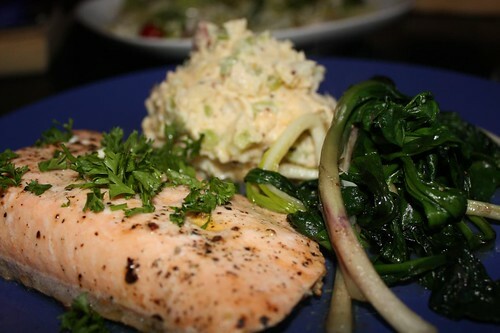 I also used it with a little lemon to poach this salmon. I was going to use some white wine to poach the salmon but there was only this in the fridge. Lighter beer tends to blend well with citrus so why not? The only risk was ruining the salmon. And the beer. And dinner for tonight. And our faith in humanity. Luckily for us it was not a terrific failure. The salmon poached well in the beer. It was a nice accompaniment to last night's leftover potato salad and some fresh ramps that I sauteed in olive oil.